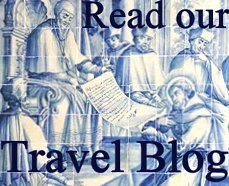 Evora, cork & wine » Lisbon stories - belong to the city! Did you know that Portugal produces 60% of the cork in the world? 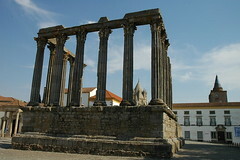 Alentejo is a somewhat unknown region in the south of Portugal. Rolling fields of gold and green, dotted with clusters of cork oaks and occasional whitewashed houses. 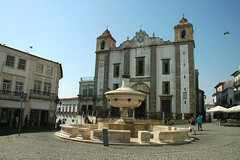 Évora is the main town in Alentejo, but it feels like a small village. 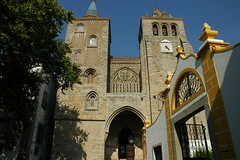 In the morning, we’ll walk through the compact historical center, declared as a UNESCO World Heritage Site, and discover its unique attractions. 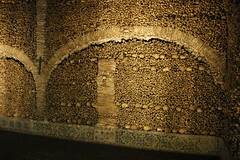 Ancient Roman ruins, a chapel made entirely of bones, a statue of a pregnant Virgin Mary, cobbled streets, tasty pastries. This town has it all! A – Sample the regional cuisine in a local restaurant and visit a cork factory. Did you know that cork lasts longer than leather? 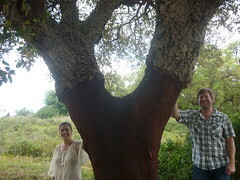 Or that a tree needs top grow for 40 years until you can harvest its cork? You’ll learn everything about this attractive, sustainable natural resource during this tour. B- Discover the delicious wines of the region while you enjoy a picnic lunch under the shade of cork oak trees on the grounds of a winery. Taste regional cheeses, smoked ham, bread, fruits, wine and other local delicacies bought in the Evora market. We call it a picnic but our guests call it’s a feast. While we clean up “the table” you’ll be taken on a tour of the winery, which ends with a complimentary tasting of 3 wines. A different day, full of the south's character. - 8 hours private tour. This program and its itinerary are fully customizable. There is no dress code but Evora is a pedestrian town so comfortable walking shoes are a must. It can be quite hot in the summer: a hat and sunscreen may be handy.